The first thing you learn about Mike Perce is that everybody who knows him calls him “Curly,” a joke on the Three Stooges. The second thing you quickly realize is that the waters of Lake Ontario threatening his community is no joke. The village of Sodus Point, with 900 residents, is among the lowest places in that vicinity and inexorably tied to the lake. The village's main business is tourism. It's all about the water here, and it has always been that way. Locals even fought British soldiers who came by the lake and created a skirmish in 1812. After the red coats landed, they burned the village to the ground, sparing one tavern that was sheltering two seriously wounded Americans. Both men eventually expired; one is buried in the historic Sodus Point Wickham Cemetery. Later the village became an important link in the Underground Railroad when fleeing slaves got on small boats bound for Canada. Because of flooding, Sodus Point is now declared a Disaster Area. “It's a tiny village,” said Mike. The village's highway budget is $250,000, with $80,000 coming from CHIPS. The village crew is responsible for 8.5 miles of road, lots of sidewalks, a village park, mowing a pioneer cemetery, and helping support a flower-filled presence through the village. By early summer, Mike and his main man Hopper (Hoppie) were truly embarrassed to see how poorly things looked because of the flooding — the sandbags and the smelly pumps. Instead of repaving roads and improving sidewalks, they are bound to a vicious cycle of sandbagging — filling them, distributing them, and now they are worrying about what it will take to clean them up. 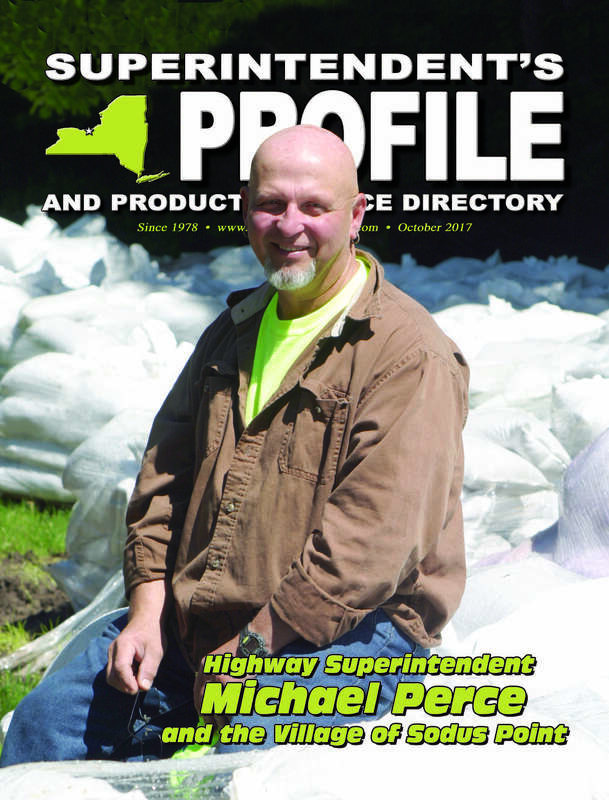 Because they had the right equipment, Sodus Point's highway department alone produced more than 100,000, 40-pound sandbags following the formula: fill, twist them twice, then tie them off and move them elsewhere. The village website helped residents by posting PDF files with information on how to stack sandbags, proper filling of sandbags, and how to calculate how many are needed to protect a property. What they didn't say is how to get rid of them. The grand total of sandbags for the entire area affected by flooding is l.6 million. Sandbags — What Are They Made From? There are hundreds of different types of sand. Some jobs are so demanding that sand is hauled around the world. Mike said they tried beach sand in sandbags in 1993, but that didn't work. Waves would break the bags open and release the sand, which was slippery. Road sand, he said, is the best. 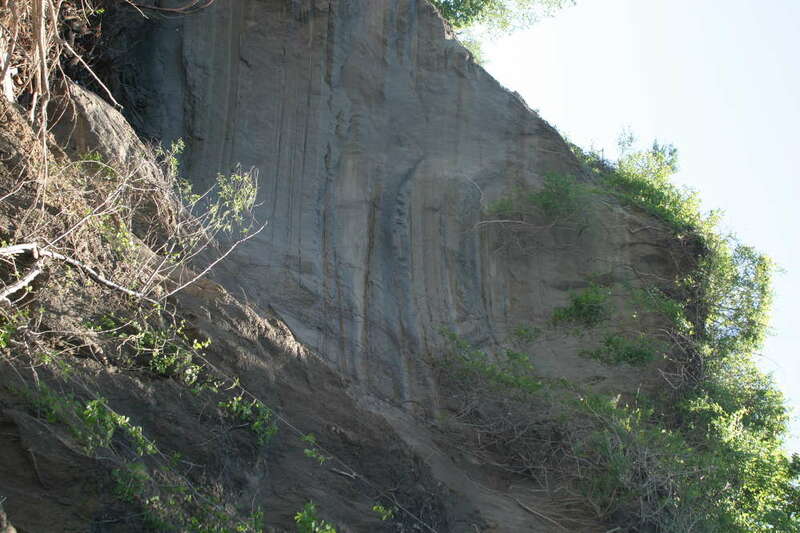 One spot of typical erosion when Lake Ontario reached the highest levels on record. Many blamed a new international law governing the lake levels between Canada and the United States. The Army Corps of Engineers said the flooding was due to heavy spring rains. 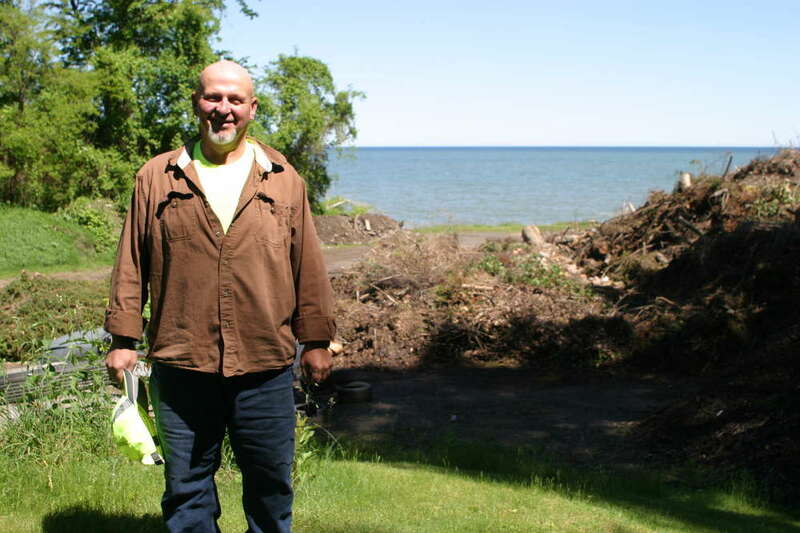 While Sodus Point has cut back on its use for sand on the roads, Mike always has back up, and other places, like the town of Sodus, off the lake, were ready to share their sand piles. All of the sand was donated by other municipalities. For example, Macedon donated 300 tons. As for the bags themselves, Mike said they are made from a “cheap,” lightweight polyurethane that is supposed to be biodegradable. They are easily torn, and once filled are hard to store in cold temperatures when they become solid like rocks. Sodus Point's garage was not only the epicenter of bags being made, but it also was where a very long parade of frantic residents lined up to get sandbags for themselves. He said family history recalls that their original surname was Nez Perce, a famous Native American tribe, but that an ancestor chose to drop the first part. He said he has done a lot of things in his lifetime and takes pride in multi-tasking, including carpentry, auto mechanics, fabrication and hunting. Following a time out for health reasons when he fell from a tree stand, he came back to the highway barn to construct a break room and parts facility. He actually got the job he has today when the then mayor came to the auto repair shop where he worked to get a quick oil change. Mike is the kind of guy who carried a pack a cigarettes around in his shirt pocket for months after he stopped smoking two packs a day, cold turkey. He's generally no nonsense, but tempered with a sense of humor. His entire family (wife and two daughters) are heavily tattooed. They all have chest, sleeve, back and leg ink in various themes, including one daughter who has an image of her three-year-old son, Kamden, Mike's only grandchild. “He is my life,” he said of their special bond. Surprisingly, the recent flooding on Lake Ontario, his highway operation becoming the epicenter of sandbagging, plus the highly agitated public lining up to get sandbags led to what people thought was a heart attack. While they have four different churches, only one local restaurant stays open year-round. This year was totally different because Lake Ontario flooded. The effects — loss of homes and businesses — are still being felt. Mike said the condemned properties were mostly caused by erosion, which is not typically covered by insurance. Some people lost 50 feet of property. Fortunately, the village's wastewater treatment system was not compromised. Flooding began around early March, and by early June, many high-priced boat docks were still underwater. Buildings of all kinds were heavily sandbagged, and large noisy pumps (in two sizes, 3-inch and 5-inch) are taking up half of the main street causing restricted traffic. Signs were posted saying, “Still Open for Business,” but Sodus Point businesses put the loss at 75 percent of a routine season. Even the highway crew was grumbling that the village didn't look right, yet. The American flag still needed to be topped on the Lighthouse Museum, and lifeguard stands were still lying around in the grass because the public beaches were still filled with debris and not open to the public. Mike remembers three distinct floods here during his lifetime. The first one occurred when he was young. He says the second one was in 1992 or 1993 when he first joined the highway department. “The water came up, but within two weeks it was done,” he said, dismissing the high water as a non-event. The summer of 2017 flood is something different. With high water and strong winds, the lake level has become its own item on the evening news. Gov. Cuomo visited the shoreline at least three times and finally declared it a Disaster Area. By early August, local officials still fear future flooding. There were a lot of people with opinions about what needed to happen next, Mike said of the initial getting started phase. But it was the pressure from those sandbags that put Mike into the hospital, taken down by what appeared to be a heart attack. Mike has 35 years of active duty, filling all positions, with the Sodus Point fire department, so he knows the signs of extreme stress in somebody else. For him, not so much. He describes a line of upset residents impatiently waiting in their cars lined around the block to get sandbags out the back gate. They had two lines of sandbag production going 24x7, plus the usual highway tasks. That part of Lake Ontario borders the city of Rochester. That's where the ambulance took him with pains in his chest, which turned out to be stress and a broken rib or two from a different event, days before, when pushing down hard on a wrench. To cope successfully with what is still an ongoing event of major proportions in the village, he said he has had to learn to relax. Lake Ontario, the 14th largest lake in the world, rarely makes the news, but this past spring and summer it gained national attention as its waters ripped homes from their perches and pounded sea walls into crumbles. While residents fear they may not get any reimbursements for their flooded properties, the governor has visited the area and has promised help. In early July, he signed legislation to provide $45 million for communities impacted by the Lake Ontario and St. Lawrence River flooding. Global warming or not, finger pointing to the cause of the tragedy began almost immediately. At the core of the dispute is some fresh, multinational legislation that was developed to aid the environment and commerce by making a causeway from the Atlantic to Lake Ontario. By name, the International Joint Commission's Plan 2014, which launched in January of this year, is now the guide by which U.S. and Canadian officials control Ontario's water levels and part of the St. Lawrence River. The plan is designed to restore damaged natural habitats along hundreds of miles of shore line as well as benefit commerce, tourism, and trade in the Great Lakes. Outside of the Florida Everglades, this plan is the largest wetlands restoration effort in the U.S. Essentially, it attempts to allow lake levels to fluctuate in a more natural way, while also protecting some endangered species. While the Army Corps of Engineers and other experts said heavy spring rains triggered the flooding, the new plan in place took much of the heat for Lake Ontario flooding. “The IJC blew it. I mean, they blew it. I don't see how you can debate that,” Cuomo said while visiting the area. While the United States blamed Canada, our neighbors to the north said they had their own flooding challenges. Increasing outflows from a dam on the St. Lawrence River would have worsened flooding in Montreal and would have only lowered Lake Ontario levels by inches. Even while the lake was 30 inches above normal, there were some positive points of view. The flooding has resulted in more science-based data gathering on the lake, including U.S. Geological Survey scientists using drones and installing water elevation sensors along the shore to help assess the damage by reporting water levels every 6 inches. Due to this flood, that data will be available online to residents, emergency responders, scientists, weather watchers, and others. Sodus Point is all about the water, which includes recreational boating. When the Wayne County Sheriff's department quickly created a 500-foot no-wake zone for boats near shore to minimize erosion, the effect was immediate. The only public launch site, combined with the no-wake zone, will make getting out into the lake for fishing or recreation about a 45-minute ride at trolling speed within 600 feet from shore. The no-wake rules were being reinforced by the law using water craft and representing the Department of Environmental Conservation, the Office of Parks, Recreation and Historic Preservation, the Division of Military and Naval Affairs, and State Police. At first they issued warnings, then there were fines. Because of the village's proximity to the water, there is always lots of scrutiny from the DEC. Mike's plan to use asphalt or concrete for sidewalks has been nixed by the DEC. The village now uses highway salt to the tune of 300 tons per year. Mike said he can imagine when everybody on the lake will use treated salt and brine. A taxidermy duck is mounted on the wall of the highway office. He was glad to fire an employee who totaled a dump truck and then parked it in the barn without saying anything about it. Another big event was a barn fire in April 2008, which got going about an hour after they left for the day. That fire was caused by a pickup truck that had smashed into a tractor in the barn, shorting out the plow on the pickup truck. A passerby noticed the smoke. Fortunately, the big trucks were outdoors having been pressure washed, but inside a new pickup and a nice tractor were destroyed to the tune of about $100,000 in damages. The New Holland loader that saved them during the sandbagging is now “going downhill.” Mike said they are going to have to figure out what to do. The village's newest piece of equipment is from 2011, while the oldest is a 2004 dump truck. He's proud to say that everything in the barn is paid for. He likes to get pickup trucks every seven years, but with larger equipment it takes longer. A lot of times they can sell older equipment right from their own lawn because buyers know the equipment has been taken care of. The village budget is tight and they won't let Mike have an office computer even though his newer equipment training manuals are now on CDs and not on hard copy. He thought the New Holland telehandler, which saw so much work sandbagging, would last another two years, but it probably won't now. He said they used the fork on it for the first time while sandbagging to his considerable satisfaction. Once again, the issues are ongoing. Because of the flooding, his original plans for the summer are on hold, and his budget is in disarray. But he is a happy man with a willing crew to back him up, including one worker whose job is to send Mike back to the office if he appears to be getting steamed.